Developing world is awash in pesticides - does it have to be? June 22, 2016 — In today’s globalized world, it is not inconceivable that one might drink coffee from Colombia in the morning, munch cashews from Vietnam for lunch and gobble grains from Ethiopia for dinner. That we can enjoy these products is thanks, in large part, to expanded pesticide use across the developing world. Every year, some 3.5 billion kilograms (7.7 billion pounds) of pesticides — a catch-all term for the herbicides, insecticides and fungicides applied to crops from seed to harvest — are used to preserve the quality and quantity of fruits, vegetables and grains. Herbicides, such as Monsanto’s weed killer glyphosate, make up the bulk of the pesticides applied worldwide. In the developing world, where swelling populations, increased urbanization and growing economies create a demand for ever-more food — produced quickly and inexpensively — pesticide application rates are rising. Bangladesh and Thailand have quadrupled their pesticide use since the early 1990s, while Ghana, Ethiopia and Burkina Faso, countries newer to the pesticide game, have seen a 10-fold increase over the same period, according to the Food and Agriculture Organization of the United Nations. 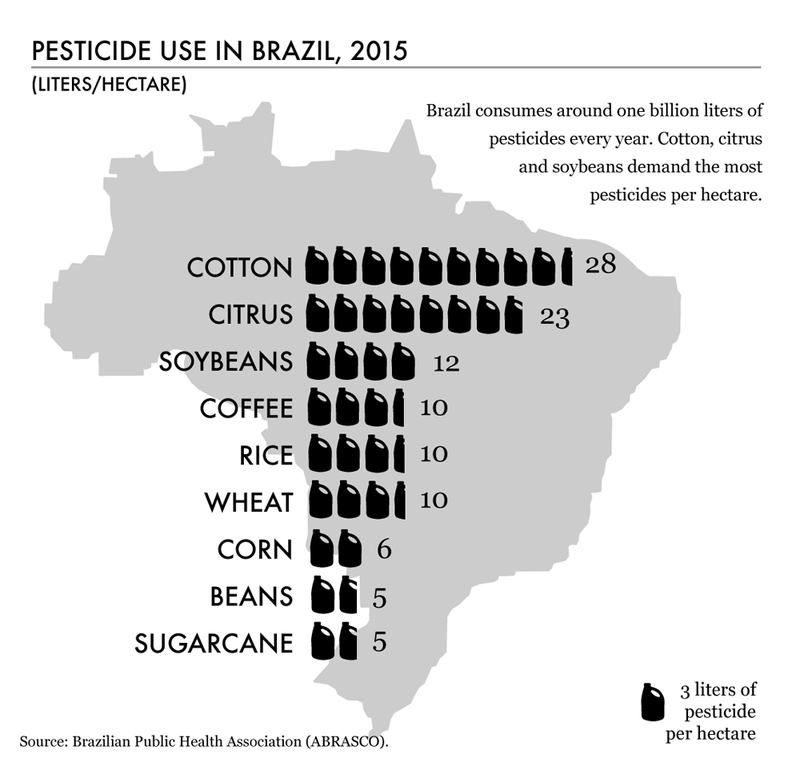 But it’s Brazil that has become the developing world’s largest pesticide user, says Victor Pelaez, an economist at Brazil’s Federal University of Paraná who studies pesticides and their regulation in that country. “Brazil is [the] second largest consumer of pesticides after the United States,” he says. 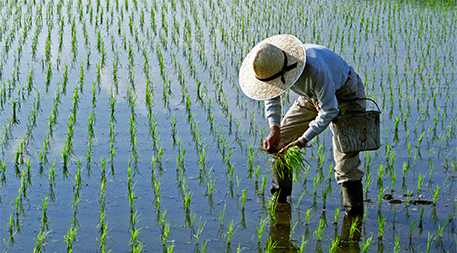 The global pesticides market is estimated to be US$45 billion. Brazil is a top exporter of soybean, corn and cotton, Pelaez says, with soy being its top cash crop. During the 2014–2015 season, Brazil produced 97 million metric tons (107 million tons) of soybeans, just a hair shy of the U.S., the world’s leading soybean producer. And with booming agriculture comes a heavy dependence on pesticides. 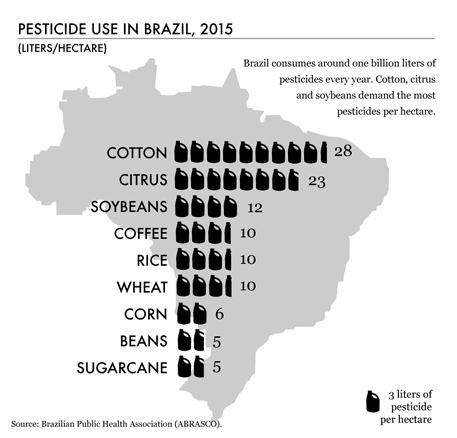 It is estimated that Brazil consumes around a billion liters (260 million gallons) of pesticides every year, and more than a third of that is applied to soybeans, according to a report from Brazil’s scientific research institute Fiocruz. 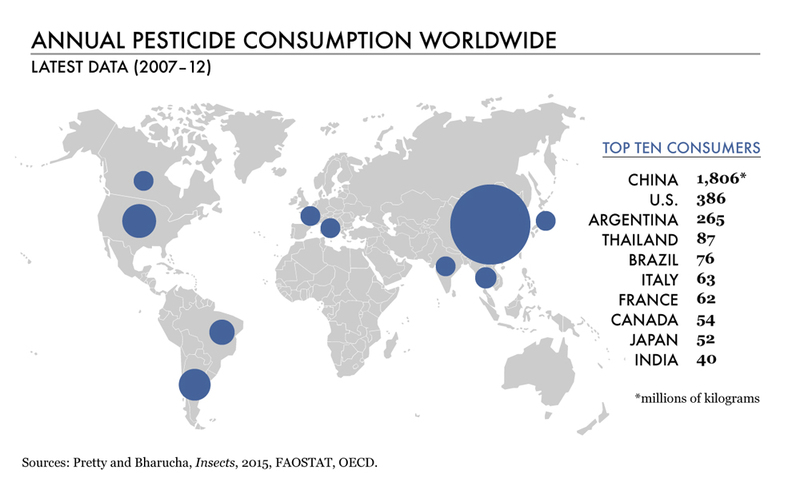 China comes in a close second among the developing world’s major pesticide consumers — in fact, some estimates have it, and not Brazil, in the top spot. It also manufactures tremendous amounts of pesticides. The country is estimated to have over 2,000 pesticide companies making more than 4.8 billion pounds (2.2 billion kilograms) of pesticides, some of which is exported. While Monsanto and Syngenta, two leading agribusiness companies, together hold close to one-third of the global fertilizer and pesticide market, experts say it is astounding that China is now rivaling the pesticide production of multinational corporations. Pesticides have boosted crop production since the dawn of agriculture. Ancient civilizations used ashes, sulfur and salts to keep pests at bay. Since then, in the race to fend off fungal diseases like tomato blight and insects like the potato beetle, pesticides have gotten stronger. And historically, at least, they have consistently paid off. By applying chemicals designed to kill, reduce or repel insects, weeds and diseases harmful to crops, developing countries are producing and exporting more food than ever before. Agricultural expansion, with farmers moving deeper into areas like the Brazilian Amazon, to produce cereals, and Indonesia’s tropical forests, to grow oil palms, is leading to more pesticide use. And so is crop intensification: Boosting yields by growing more food on the same area of land inevitably leads to more pesticide use. In fact, a 2012 study reported in Food Policy analyzing FAO data from 1990 to 2009 found that a 1 percent increase in crop output was associated with a 1.8 percent increase in pesticide use. Of particular concern to many is pesticides’ toll on human health. But with intensified agriculture and increased reliance on pesticides come trade-offs. Pesticides have been proven to harm pollinators like bees, according to a recent report released by the U.S. Environmental Protection Agency. They’ve also been shown to disrupt ecosystems by adversely affecting nontarget plant species, and those that mimic hormones can harm animal health. Of particular concern to many is pesticides’ toll on human health. Pesticides have been proven to have a variety of impacts in this arena, ranging from acute, deadly poisoning to respiratory conditions to cancer, particularly in children. Despite harrowing findings being published in the scientific journal The Lancet Oncology, the agribusiness companies marketing the pesticides have not stopped their production. Monsanto, which makes almost one-third of its earnings from glyphosate, says it “strongly disagrees” with the WHO’s conclusions. 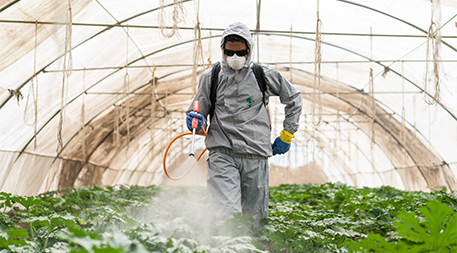 Occupational exposure is a common problem in developing countries, where workers applying pesticides are less likely than workers in developed countries to use protective equipment. The ramifications of this exposure can go beyond the worker. A 2010 study in Ecuador published in Environmental Health Perspectives found that prenatal exposure to pesticides from mothers who worked in the Ecuadorian flower industry was associated with impaired visual memory and motor tasks in their children. Several U.S. studies are tracking intellectual impairment and behavior problems in children exposed to pesticides. But in the developing world, sparse health care infrastructure is a major barrier to understanding the extent of pesticide poisoning. The epidemiology of pesticide exposure globally is not fully understood and most of the time underdiagnosed, according to the Pan American Health Organization, an international public health agency based in Washington, D.C. “Pesticide poisoning cases are under-reported by 50 percent to 80 percent regionwide,” reported the PAHO in 2011, referring to the Americas. Though it is difficult to study the health effects of pesticide use, especially in developing countries, the PAHO correlates the rise in childhood pesticide poisoning with increased import of pesticides for agriculture. Problems arise when hazardous pesticides are distributed to people without adequate training regarding potential dangers and proper handling — as was the case in 2013 in India when 23 schoolchildren were killed after eating a meal contaminated with the pesticide monocrotophos. To improve pesticide management and avoid serious poisonings, the FAO is calling on countries to adhere to an “International Code of Conduct of Pesticide Management,” a voluntary framework that promotes best practices to prevent and reduce exposure to pesticides during handling, storage, transport, use and disposal. That this international code of conduct is nonbinding is symptomatic of how difficult it is to control and manage pesticide use. While various international conventions — such as the Stockholm Convention on Persistent Organic Pollutants — have been organized to regulate specific pesticide chemicals, and international agencies such as the FAO have issued guidelines, such as “Save and Grow,” with suggestions for pesticide reduction, there is no comprehensive global regulatory framework to help guide policy for the transport, storage and use of pesticides. “How much is too much?” is a question with which Jules Pretty, a professor at the University of Essex in the United Kingdom, is constantly grappling. What’s encouraging is the growing evidence that farmers can lower their dependence on pesticides while maintaining agricultural production, sometimes by employing techniques that date back thousands of years. Over the past 25 years, Pretty has been studying sustainable agriculture practices around the world. He has shown that there’s growing proof that integrated pest management — a strategy that uses alternative, diversified and historic agronomic practices to control pests — can help reduce pesticide use in a variety of farming systems. 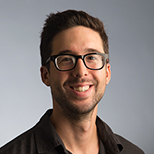 In 2015, Pretty and colleagues published a meta-analysis of 85 field sites in 24 countries in Asia and Africa that employed IPM techniques and reduced pesticide use while boosting crop yields. Some eliminated pesticides entirely by using techniques such as crop rotation and pheromone traps to capture pests, says Pretty. Farmers who use pesticides in China, for example, were shown through community learning programs known as farmer field schools that pests could infest their rice crops for 40 days before harvest with no effect on yield, Pretty explains. That knowledge, once transmitted and proven to local farmers, could avoid a lot of unnecessary spraying, says Pretty. But these new practices are often difficult to adopt. Farmers have to see the benefits for themselves before they rein in pesticides. The key to reducing farmers’ dependence on pesticides, says Pretty, is the use of farmer field schools, which are increasingly popular worldwide, though not always successful. “It’s the idea of an outdoor learning environment where they do experiments,” he explains. Instead of forcing farmers to adopt a new practice or follow a new policy, farmer field schools allow farmers to experiment with new techniques with their peers. Pretty is confident that if enough farmers in enough developing countries can become convinced of the benefits of sustainable farming practices like IPM, the world’s reliance on pesticides can be lowered. Surely we must adopt a more open and inquiring mind with regard to human health risks and the causation of illness or disease. The discussion is effectively shut down because rich corporate interests and their legal teams brand questioners irrational, unreasonable and unpublic-spirited, as though we were against food production itself! In fact organic producers are in favour of the only truly sustainable food production methods available. The voices of people who urge the precautionary principle are not heard in public forums. This is patently a form of corporate (and effectively, government) censorship or suppression of information to which the public has a right of access. When I read that Brazil pours a billion litres of toxic synthetic chemical into the environment each year, my first thought is Zika Virus and the raft of mosquito borne diseases that have emerged in the last 40 years. A related issue that also may not be dismissed out of hand is the content of infant vaccination drugs. Human ecology and the entire spectrum of environmental issues in a deteriorating global climate are inseparable. We dare not as a species continue to compartmentalise the study and debate of environmental health issues, let alone allow any self-interested corporations or their associates to kill, harass or brand public health advocates with impunity. I have much appreciated Aleszu Bajak's work today and ensia.com will be an important aid to my personal studies. The more facts we have, the more pressure we can put on regulators and policy makers. Agricultural scientists prefer genetic approaches to pest and disease control over pesticides. Unfortunately, the abundant options available to us through genetic engineering (for example, see http://www.mdpi.com/2071-1050/8/5/495) generate so much controversy that perfectly suitable approaches for controlling pests and diseases remain unused or undeveloped. Consequently, farmers opt for effective pesticides. We need to provide them more non-pesticidal options, but presently we are underutilizing the power of genetic engineering to address these important challenges. In every region it also is possible to grow endemic products, IOW from plants and trees that developed natural resistance against local pests. Such products often don't have the polished look of industrial produce but are much healthier: many chemical compounds the plants and tree produce in their battle against pests have shown health benefits for man, a fairly recent example regards salvestrol, another, resveratrol. So one form of action could be to promote local produce, provide clean, effective (electric) transportation and informing the public that the polished look of industrial produce too often is a bad sign for the health of consumers.